The Armortech-HD was voted best buy winner, from Inside Archery magazine, its very first year on the market! The Armortech-HD packs a punch with its superior patented technology, innovative design, and deadly accuracy. Features fibers that are protected their entire length by Axcelâ€™s A.F.T. (Armor Fiber Technology) and an innovative scope design T.C.V. (True Center Vision). 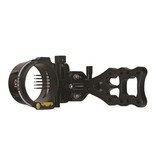 All Armortech-HD sights are available with 4, 5,or 7 pins in .010â€, .019â€or .029â€ fiber size. also available with the HS (High Speed) option and the MathewsÂ® Harmonic Damper option (Armortech-HD model). The Armortech features all the same great features as the Armortech-HD, without the MathewsÂ® Harmonic Damper. All Armortech Sights are compatible with 1 3/4" or 43MM diameter lenses.